Years ago when I first started researching what kind of dog that I wanted to bring into our family, I looked at a lot of different breeds. Several things attracted me to the Toy Australian Shepherd. First of all, I liked the size. At around 10-14 lbs, they are big enough to be able to jump up in your car to take a road trip, but still small enough to snuggle on your lap. And they keep that puppy face – oh, that sweet puppy face! I love that full-grown Toy Australian Shepherds still look like puppies. I also liked that they do not have to be groomed regularly – just brushing out their undercoat gives them a great look and keeps shedding down. (They do shed though!) 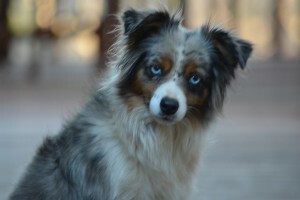 All that combined with a beautiful coat and blue eyes makes these dogs irresistible on the cuteness factor! They are also super with children. 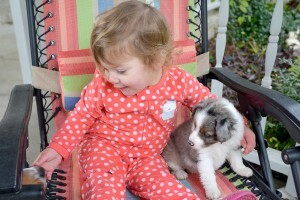 They can handle a toddler picking them up, and can chase kiddos around the yard until everyone’s exhausted. They are also wonderful, protective companions. They can get a little shy and apprehensive around strangers, though. But once they bond with your family, they have a lifetime commitment to you. All they will want is time with the ones they love. They are extraordinarily smart and easy to train. 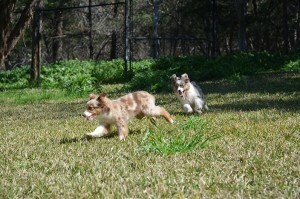 They love to run and have a natural herding instinct. Dakota, one of our females loves to herd our chickens. The rest enjoy herding kiddos around. They have lots of energy, and need exercise regularly. Please do not bring a Toy Australian Shepherd home if you do not have time to work with and love them. Since they are so smart, they get bored easily and do not handle being cooped up in a crate or small room for long periods of time. 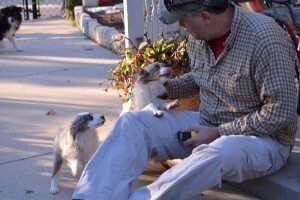 Given the proper love and home, though, Toy Aussies will make an amazing pet for your family.